The Dog Squad Team and the Pipe Band Team of Sashastra Seema Bal (SSB) Frontier Siliguri participated in a programme organized by the Siliguri Police Commissionerate on the eve of 70th Republic Day Celebration at Police Line Mallaguri, Siliguri on 26th January, 2019. During the programme various Govt. organizations including schools, colleges, clubs etc. participated in said programme and presented their shows. Apart from these, the performance of SSB Dog Squad and Pipe Band Team of Frontier Siliguri attracted entertaining attention and enjoyed it a lot by the audiences. 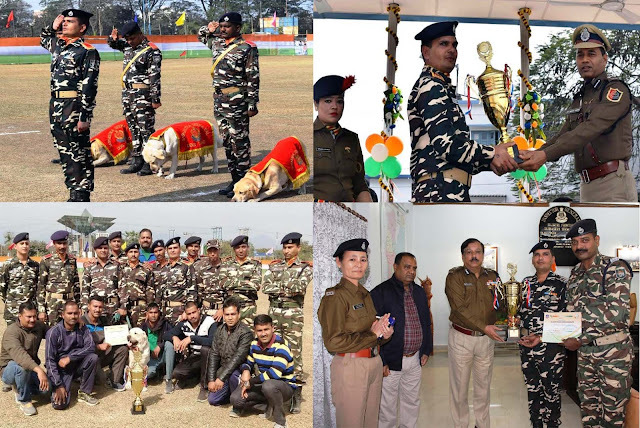 The performance of Dog Squad Team and Pipe Band Team of SSB appreciated and adjudged as first (1st) position and owned Special prize respectively with winning trophy and certificate.